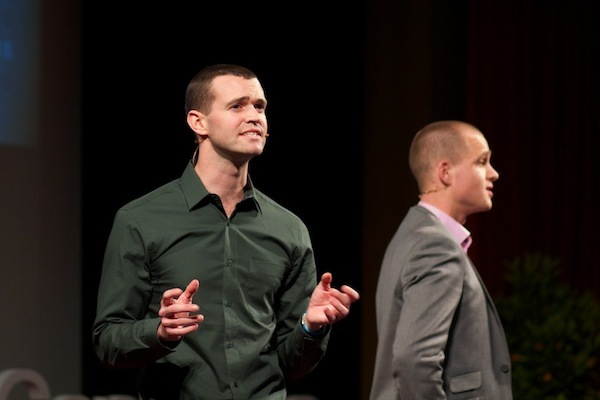 Jack Lloyd and Mick Bailey at TEDx Canberra. Image by Gavin Tapp. This year, science-theatre ensemble Boho Interactive (Mick Bailey, Jack Lloyd and myself) was invited to talk at the Canberra TEDx Conference. On Saturday 24 September, Mick and Jack presented a performance-lecture discussing Boho’s work in communicating ideas from complex systems science through interactive theatre. 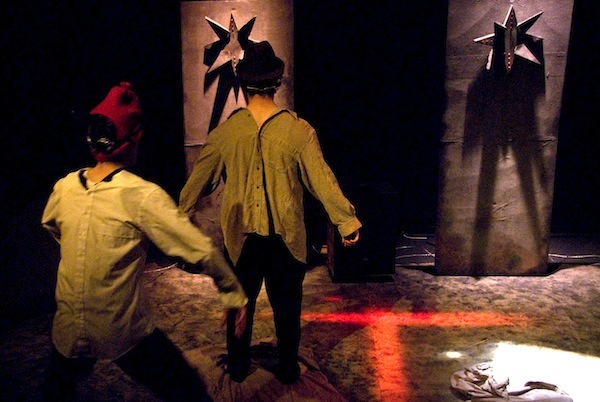 The Treasure Hunt is a scene we love using because it gets the audience working directly with the environment, so it’s great to break down walls. Depending on what you want to achieve, there are good ways to get story content out at the same time… The focus is on exploration, experimentation, puzzle solving and discovery. Improvisation is generally not necessary, the scene itself is kind of the star anyway so performance elements can be quite minimal. Secondly, I’ve scribbled a little bit about failure – what it means when an interactive sequence falls apart in performance, or when the audience completely fails to understand or solve the activity you’ve created for them. In True Logic of the Future, we had a puzzle built around the Logic Piano (a replica of WS Jevons’ 19th century early computer construct). In this sequence, two scenes played out simultaneously – one set in a hospital, and one set at the scene of a crime by the city’s dam. The audience used the logic piano to separate out the two scenes, filtering the messy sequence into its constituent parts. Have a butcher’s at the site, and feel free to drop us a line or comment if you have anything to add (or dispute). A shot from probably the best Boho sequence in our whole company history: Flying Dudes. Image by ‘pling.